Whilst many bloggers don’t like awards, I think it is an honour for someone to think your blog worthy of such attention. It a great way for readers to discover other blogs that might hitherto be unseen, and as a bonus, with this award, one gets to read some interesting facts or opinions about the blogger, that is me, and I rarely post anything personal. Furthermore, I also like and encourage others to create their own logo, so it initiates creativity. However, I do fully understand the uninvited extra work involved in accepting an award and thus, I place no conditions, on the blogs I nominate, to pass it on to others. In bestowing this award, I merely wish to say thanks for having a great blog and I like that you are here in the blogging community reading what I have to say. In addition, please note that I gain so much enjoyment from visiting your blog. 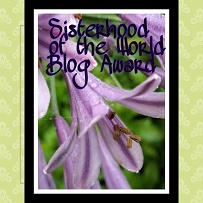 So it is with this sentiment, that I say many thanks to Millie Thom who has nominated me for the Sisterhood of the World Bloggers Award. How would you describe what your blog is about? I blog about things that are important to me or information that is useful to others, with a heavy emphasis on my traditional art and craft, photography and essential life matters but this is not fixed in stone. Do you see your blog changing (as in expanding or developing in any way) at some stage in the future? I certainly hope so, but if it stays as it is, my own almanac/ journal for future descendants and anyone interested enough to read it, I will be content. Do you write your blog posts straight onto the WordPress page or onto a word document first? When you write, do you need to be on your own or are you happy to write with others around you? Easy to write when it is quiet, unless it is a photographic post and then I have no problem if my family are close by chatting. But I prefer to participate in social situations, to resort to technology on those occasions, is isolating. Which is your favourite species of tree, and why do you like it? Conifers! They are evergreen, even in the snow, and have intriguing branchlets instead of leaves. Normally I would like something functional as a favourite object, ie. something that doubles as a food source as well as being aesthetic, but conifers are exceptional! They come in so many varieties and always have a welcoming permanence, and a nice shape. If you were to have a day out somewhere easily reachable from your home, where would it be? To somewhere near the water with lots of greenery and fresh air to breathe. Not a problem if the greenery is covered in snow, but that is extremely unlikely to happen, so either way, it’s all good. Which ‘celebration’ (annual or otherwise) in the country where you live do you enjoy the most? A fireworks spectacular or a food festival. It is fun to try different dishes or cuisine, and who can resist a fireworks display. Huge waste of money, and so transient, but darn mesmerizing when it happens. Which way would you choose to travel, given the choice: car or train? Both appeal, so this is difficult to choose either one. Perhaps the car as it affords one more freedom in terms of the route chosen. Which subject did you enjoy the most at school? Japanese and when I could no longer do that – History and Geography – isn’t that a given? What do you think is the best thing about being a woman today? The freedoms we have that are denied to some people, be they male or female: freedom to travel and move about, to vote, to love who we want, to work where we wish (mostly), the freedom to wear fashionable clothes, or not, if we wish. There is more work to be done but we have self-determination, and the freedom for a man to romance us if we choose. Freedom to vote is very important to me, given that woman once were willing to go to extremes to achieve this simple right! Nominees: thanks for having a great blog and I like that you are here in the blogging community reading what I have to say. In addition, please note that I gain so much enjoyment from visiting your blog. I don’t really like to dictate questions, so I would be interested in them answering the final question above, if they wish to participate. Give your nominees questions to answer. Include the logo of the award in a post or on your blog – your choice which one. Congratulations on the nomination, Amanda. It was very interesting to read your responses to the questions. It is interesting you can write your blog posts(photo) with people buzzing around you. Such a multi-tasker. Rarely do I feel like I can focus on writing when people are in my ear. Then again, you and I write about very different subjects. Even when I’m choosing and editing my photos, I need peace and quiet, or music that I like blasting in my ears. Thank you for the nomination. I am so humbled, and will put a link to your lovely logo on my Award page. It is a very simple yet vivid logo 🙂 Love the question that you posed. Being a woman means not having to take no for an answer. It is about standing up for ourselves and just because we are physically (and perhaps emotionally) wired than others, we can do just about anything we want if we set our mind to it. It is about speaking up for what we believe in, speaking up and letting our voices be heard and if we work together with everyone around us, the world will be a much more equal place. Here here, Mabel. Well said! I hope that the young woman of today do feel they can speak up about what they believe in! An equal world would be a far better world. As for the nomination, it is very well deserved! I am glad you like the logo and it would be flattering for you to use it on your blog. Feel free also to make one of your own, if you wish with one of your beautiful photos! What great answers, Amanda, and I love your new logo! It’s much nicer than the one I received and passed on. Your last answer was really thoughtful and the question is an interesting one to pass on for the ‘Sisterhood’ Award, I think. It was also interesting to know that your favourite types of trees are conifers. I agree that their shape and structure can be very appealing. We don’t have too many big varieties here, as they do in the US, wihere Redwoods and Sequoias are spectacular. I’ve no idea which varieties you have in Australia, but I’m guessing they’re lage ones! Thank you so much for accepting the Award. Your blog is excellent and deserves all the recognition it can get. .
Oh thanks, Millie. We have conifers mainly as ornamental shrubs although there are some native cypress that are useful timber soecies as they are termite proof, well, almost. Some also with golden foliage in the sub troical areas. It is a battle keeping the water up to them and thus alive, in the terrible heat of summer. My pleasure, Millie.I thank you for giving me the opportunity to accept and respond. For the most part, you are correct about the conifers. The ornamental shrubs do better in the mountainous areas, or at higher elevations. I have managed to keep some of them alive for a few years. However, there are a few juniper species and cypress variants that also do well in drier areas, like the one I mentioned before, that is used for the timber industry. It grows quite large. There is also a Hoop pine, which is not a great conifer, very sparse foliage and looks a bit pathetic if one tries to turn it, as some do, into an Australian Xmas tree. Still it is used extensively in the timber industry ( the termites love it, unfortunately), and is a fast growing species. Having just read your post Amanda, which is very good as per usual, I thought I’d let you know about why you can’t use Word to write posts etc (I know you don’t use it anyway). Microsoft Word adds its own formatting (html) to its documents, which when copied direct to wordpress, it adds this html to the wordpress code, and basically ‘screws it up’!! But if you use the basic ‘notepad’ feature on the pc, this text is unformatted, and is fine to directly copy onto the wordpress editor. Awesome! Awesome Andy!! LOL! Thanks so much. That explains everything, and I think I might use the notepad feature to do just as you explained. Mind you, I am a bit used to writing into the wpress editor now, adding photos and links as I go. It will I think be especially useful for drafts on the hop… as I have cluttered up my dashboard with many drafts that never make it to publication. Thanks again, extremely useful information!!! I’m pleased it made sense Amanda 🙂 And I use the notepad for my drafts, just remember that you can’t put images on it (I just write the image title), or do anything other than the most basic formatting, but it’s a great way to get the written bit down first, then format it as you copy the stuff to wordpress. Thank you so much, Amanda – I appreciate this very much! I agree on your writing that it is a very good opportunity to tell bloggers how much we appreciate them, and also a great possibility to direct others to new interesting blogs. Oh, I really try not to do awards…but as I have taken a year off, and you are so sweet, and your new badge is beautiful – and for all the reasons you mention…I will. Maybe not all the questions, but some. Dear Ann Christine, Please do not feel pressured to read my blog, or indeed answer all the questions. I am happy if you answer one, that final one about woman, because it is an interesting question in light of the feminine nature of the award. Thanks of the compliment on the new badge. I actually felt the text could have been done better but I was constrained by the fonts in PicsArt. Are you having an extended holiday from work or planning retirement? I hope you are on holiday next summer for we many get to meet when I visit Scandinavia again? Amanda, I’m having a year off…and maybe I will not go back to work. let’s see how I manage…Are you coming again next summer? I know we are going to Spain (Bilbao, Guggenheim…always wanted to visit…)two weeks in July. It would be great to meet up! Ah, so you are contemplating retirement? I am coming again next summer. Maybe I will come over to Sweden on the ferry and we could meet this time. I will keep you updated as I make further plans. At this stage, I will be in Norway til mid June, and I have a short trip to Poland and Berlin. Spain sounds lovely. I look forward to seeing your photos.